I'm taking a couple days off for the holidays, but here's a blog rerun of a gorgeous Mahalia Jackson song. I also wanted to add a link to a live recording of Come Sunday from the 1958 Newport Jazz Festival at the top here. Enjoy! I have the good fortune this winter of singing as a guest vocalist for the Richard Nelson Quintet, a jazz quintet based here in Maine. We’re doing a holiday-ish concert in December that Richard is calling “A Concert in the Spirit of Peace and Serenity” (concert details are on my website). One of the first songs Richard asked me to sing for this show is one of my favorite melodies written by Duke Ellington: Come Sunday. 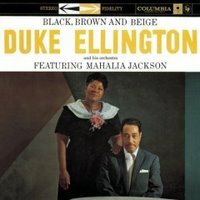 Besides the fact that “Come Sunday” has a gorgeous melody sung by one of my musical heroines, Mahalia Jackson, I’ve always been intrigued by the album it came from, Ellington’s Black, Brown and Beige. It’s interesting to me because we tend to see people in certain ways. When they move outside of that view we’ve created it can be, well, disconcerting to say the least. The symphony wasn’t exactly jazz music, and it wasn’t exactly classical music. The critics couldn’t fit it into any set category of music, and their reviews and responses were so fiercely negative that Ellington never performed the entire piece in public again. Luckily, he later recorded some of the music from this concert (though never the entire repertoire) on the album Black, Brown, and Beige, and it is there that we can here the lovely Mahalia Jackson singing Part IV: Come Sunday.